The photos above were taken on Panglao Island.The island is connected by 2 bridges to the main island of Bohol Province in the Visayas, south central Philippines. 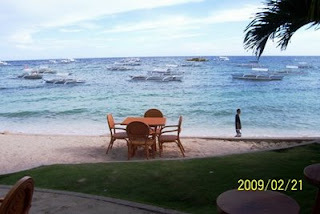 Alona (Kew White) Beach is the most popular. The island is a National Integrated Protected Areas Systems of the Philippines, and listed in the UNESCO World Heritage site. Panglao is very rural (mostly fisher folks and farmers), and home to some urbanites from Manila (artists I heard), ex-pats and their family, or retired beach lovers. What is there to do? Sun, surf, diving, and more diving. 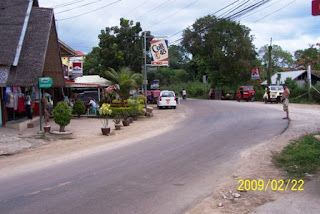 First photo on top is the shopping center on the main highway circling the island. Directly across is the entrance to Kew White Beach. 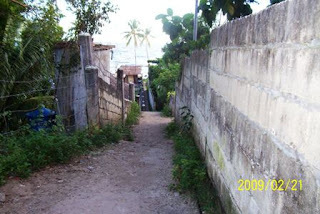 The next photo is one of the many "side streets" off the highway leading down to the beach. Table and chairs belong to the beach restaurant/bar of the Isis Bungalows, where I stayed, with a very mediterranean building. The restaurant specializes in Thai cuisine, with a Thai chef. 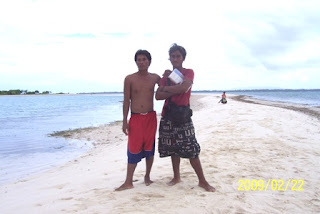 Finally, the photo of the two guys was from another island they call, "Virgin" island (not the real name), because it's off limits for habitation or overnight stay. So, it's still virgin in that respect . A few interesting things I found out about these two. Larry in the red shorts lives on another island, and is a welder by trade. He comes to visit his parents a few months out of the year, and works as a diving/boating guide. His cousin, wearing a sarong (lava lava, lap lap or wrap around skirt) with long braided hair, sells gold jewellery, sea pearls on the island or wherever he finds tourists. I learned from Larry, that he is Christian-Muslim, a mixture of Visayan and Badjao, while his cousin, is pure Badjao. Badjaos? They're known as sea gypsies, sea nomads or "man of the seas". Their communities are built on stilts in the water. They're found in the southern tip of the Philippines, in Sulu Province, Borneo and Celebes. Larry's father as a matter of fact is a Malaysian Badjao, a Muslim, who married a Visayan (Filipino) Christian.